This is actually pretty amazing given the threat that the government could actually again try to confiscate guns in the country. That imposes a real potential tax on gun ownership. Weirdly, gun control advocates are claiming that the buy back is lowering suicides at the same time that they are upset that gun ownership is back to it pre-buy back levels. One doesn't need a semi-auto to commit suicide. 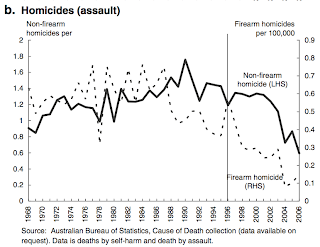 While Australia's population grew by 20 percent between 1997 and 2011, apparently its gun ownership rate grew by 45 percent. If they are right, the pattern should have been clear: suicides with guns should have plunged in 1997 and then quickly grown after that. Obviously that pattern wasn't what was observed. 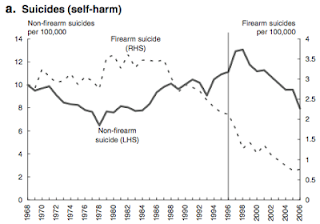 Note another inconsistency with the claims that the gun buyback lowered suicides: firearm suicides started falling an entire decade before the gun buyback and the rate of decline was the same both before and after the buyback. So how can it be that the buyback was the cause? A final inconsistency is that after the buyback the drop in firearm suicides is about the same size as non-firearm suicides. By what theory would a gun buyback cause a very similar drop in non-firearm suicides? 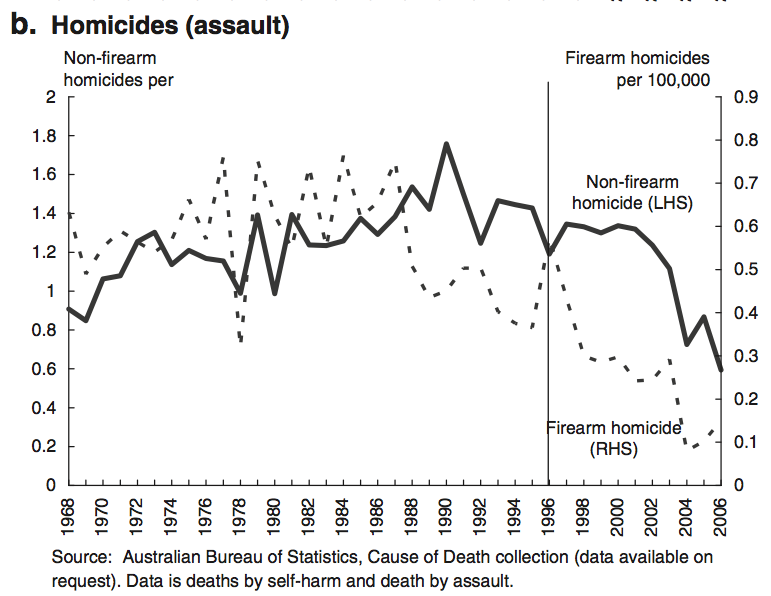 Note that homicides have almost the same pattern as suicides. While there is more variability year to year, firearm homicides actually started falling in the late 1980s and both firearm and non-firearm homicides have been falling since the buyback. Again, how is this consistent with a large buyback followed by increased gun ownership? There should have been an immediate large drop and then an increase. It doesn't take a "military-style semi-automatic" to commit suicide with a gun. More information on the claims by Alpers is available here. Some info on the type of guns that can be owned there, semi-autos are allowed if they are less than 40 caliber and magazines are limited to 10 bullets. Revolvers were not impacted as much. Information on ownership across Australia is available here.